Our carbon seal rings are specially designed for mechanical seal that are generally used in railways for their diesel engines. The oil seal forms a vital component of railway brake system. Manufactured from specially formulated carbon-graphite material with superior physical properties, these mechanical carbon seal rings are machined to close dimensional tolerance and lapped to two light bands. 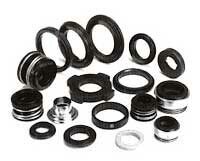 Today, we are considered as one of the venerable carbon sealing rings manufacturers and exporters from India.